November 14, 2016, Respect The Underground showed their contribution to the hip-hop culture by hosting their 3rd Annual Arizona Hip-Hop festival at the Comerica Theatre in Phoenix, Arizona. When I got to the downtown Phoenix area, I was not sure if I was in the right place. Being a New york native that recently covered the Brooklyn Hip-Hop Festivals and the Rock Steady Crew Anniversary, I was used to being backed up in traffic for 5 blocks before reaching the venues. I found parking about a block away and the moment I turned off the car engine, I heard the music's Base. The sound of hip-hop was in the air from a couple of blocks away and I was excited to be there. It's amazing how you can walk a radius of 3 blocks in some communities and the entire culture can change. Behind the ticket gate was a live stage performance right outside with hundreds of Hiphoppas everywhere. Young and old, artists and fans mixing up at what seemed to be the hip-hop heartbeat of Phoenix Arizona. The Lineup for the 2016 AZ Hip Hop Festival was estimated to present 245 local artists. Walking in the venues, there were music artists signing autographs, with 50 vendors from clothing designer, tattoo artist, creating designs, food trucks, and another stage with another set of local artists moving the crowd. 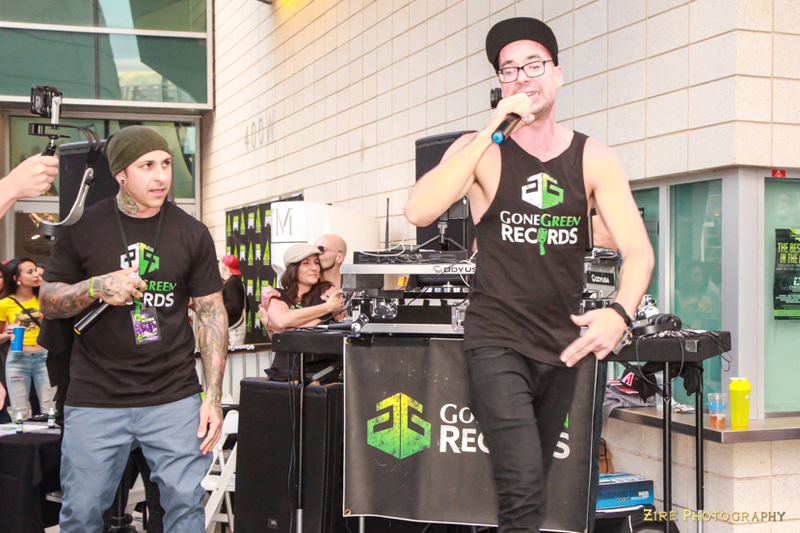 There was a deejays and producers section at the event were Arizona's premier and upcoming music makers played new music and original beats. All that was just in the lobby of the Comerica Theatre. Entering the arena, on the balcony right above the stage lined a collection of 25 local graffiti artists, visual artists, and painters. The Stage... What a show. Every show, every stage, every artist represented to the fulliest... The emcees had Delivery, Flow and Stage Presence, each artist gave an energy filled show. Shout out to the Hiphoppas who showed up and supported the event, the artists and the culture.